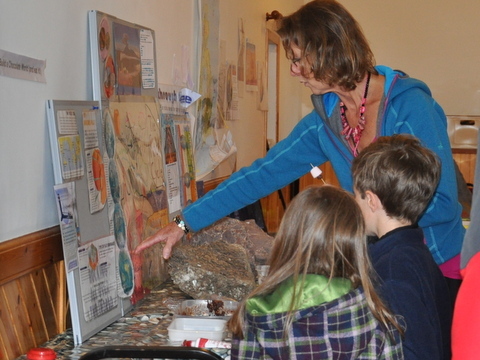 One of the big events of this year’s Shetland Nature Festival was ‘A Blast from the Past!’ – a family fun day at Eshaness based around Shetland’s now extinct 395 million year old volcano. Four enthusiastic volunteers from the Scottish Geodiversity Forum fired festival-goers with passion for all things geological. The event built on the success of the Volcano Fun Days in Edinburgh and provided activities for little kids and big kids alike. 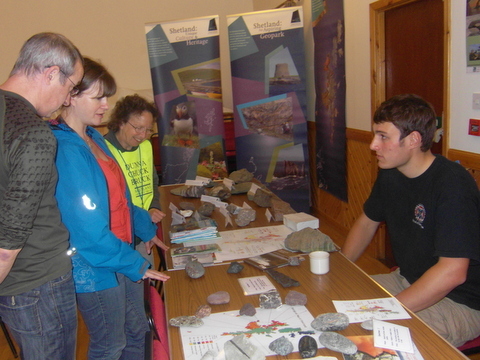 Impressive displays and a huge variety of samples gave visitors the chance to get hands-on with Shetland’s rocks and minerals, and a selection from further afield courtesy of Diana Turner. Dr Beverly Bergman demonstrated how to build a volcano and explode it, and how to model a caldera collapse using flour, balloons and just a splash of glitter! Recent geology graduates Will Moreland and Chris Lofthouse introduced visitors to Shetland’s geological development through maps and specimens and helped youngsters to get creative through geo-art. Those exhausted with all this activity could recruit their strength by making a chocolate world and eating it (!) before enjoying a ‘Lakes and Lava’ walk on Braewick Beach led by Jonathan Swale of Scottish Natural Heritage or exploring a section of Shetland’s volcano along the beautiful Eshaness coast. Shetland Nature Festival is a partnership between Shetland Amenity Trust, the RSPB, Scottish Natural Heritage and Shetland Islands Council. ‘A Blast from the Past’ was made possible by funding from the Heritage Lottery Fund’s Awards for All Scotland scheme. For further information about Geopark Shetland or Shetland Nature Festival visit www.geoparkshetland.org.uk / www.shetlandnaturefestival.co.uk or find us on Facebook. Geopark Shetland would like to thank Diana, Beverly, Will, Chris, the Braewick Café and the Scottish Geodiversity Forum for all their hard work and support.